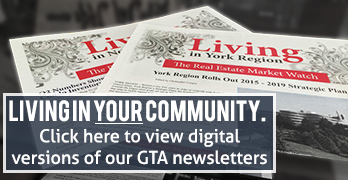 INFOGRAPHIC: How does Toronto's prime property market stack up? 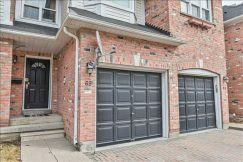 GREATER TORONTO – When it comes to value, high-end real estate buyers could do far worse than purchasing in Toronto — where a single square meter of prime real estate will likely prove far more affordable than one in New York or Hong Kong. The latter two were among more than a dozen markets examined in Knight Frank’s new study entitled Global Cities: The 2016 Report, which compared how many square meters $1 million USD could get you in each one. While Knight Frank’s published figures – which range from just 17 square metres in Monaco, to 255 in Cape Town – omitted the City of Toronto, we did some research of our own by examining 23 high-end condos. The criteria were simple: each listing within our study was active during the month of March, listed for a price of $800,000 or greater, and located in an area that would be considered “prime” land by most local real estate experts. 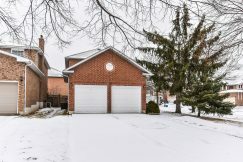 Our sampling of listings came from a broad cross-section of neighbourhoods, from Mimico and High Park in the city’s west end, to Leaside and the Beaches in the east – as well as classic high-net-worth enclaves like Rosedale, the Annex and the Discovery District. They also ranged in square feet from roughly 1,000 to 3,500. 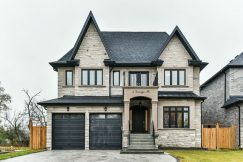 When averaged out, though, the selected listings were set for a mean asking price of $1,577,688 CAD. 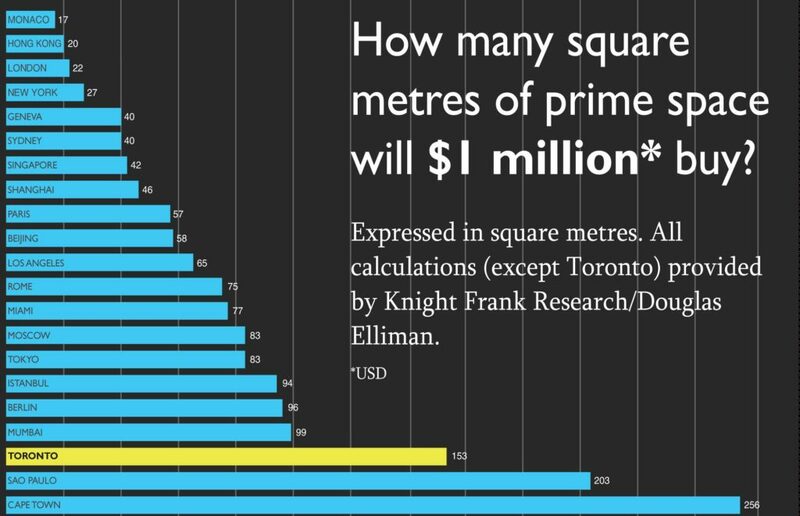 After conversion to Knight Frank’s units, we’re left with an average prime listing price of $6,545.82 per square metre — meaning that, if you had exactly $1 million to spend, you could afford roughly 153 square metres (about 1,647 square feet) of prime Toronto real estate. To put it into perspective, that’s roughly seven times what the same amount would purchase in London, England. It’s also 50 square feet less than what you could buy in sunny Sao Paulo, Brazil, but an impressive 54 square feet more than your money would get you in the high-density urban centre of Mumbai, India. 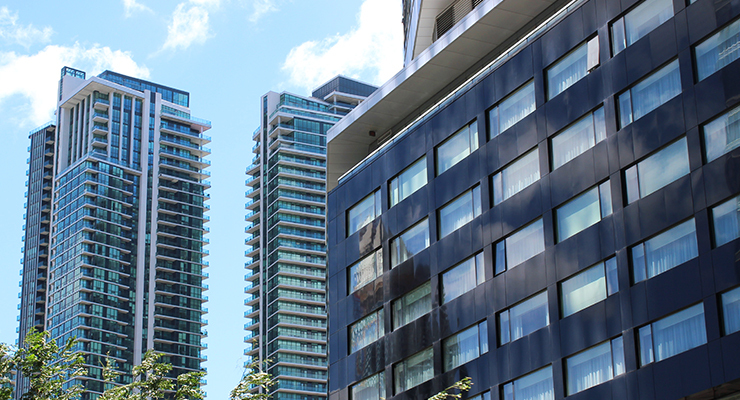 Those curious about the trend of Toronto’s prime land values can find some insight in the Wealth Report’s “PIRI 100,” which examines annual changes in each major market’s Prime International Residential Index (PIRI). For 2015, Toronto saw an annual PIRI percentage increase of 8.0 per cent – the 12th biggest increase among tracked cities. Another major Canadian prime market, Vancouver, marked the year’s biggest PIRI increase, among the 100 tracked cities, with a jump of 24.5 per cent. I would invest my money on the highest square meter if i have a million. Im really amazed by the graph above. That’s the reason why Monaco had the most of millionaires living there because its so expensive! Nevertheless, this could mean a very good business in Toronto and Vancouver.